Well I wanted to get more involved in challenges and when I saw this challenge over at Inkurable Stampers I said yikes, this means no embellies, not second layers, no flowers no nothing. So.....after creating a tag I was doing with many layers of paper involved I thought what can I possibley do to make it one layer. I first measured the front panel of my greeting card and using my paper cutter I cut the size, then I measured a width to make a border evenly around the edges. I drew lines then cut out the middle part of the cardstock so I had what would look like matting for a picture. I then applied some repositional glue on the backside around the edges of the opening and let it try. I then applied it to the front of the card and made sure the top pieces was down well for my next step. 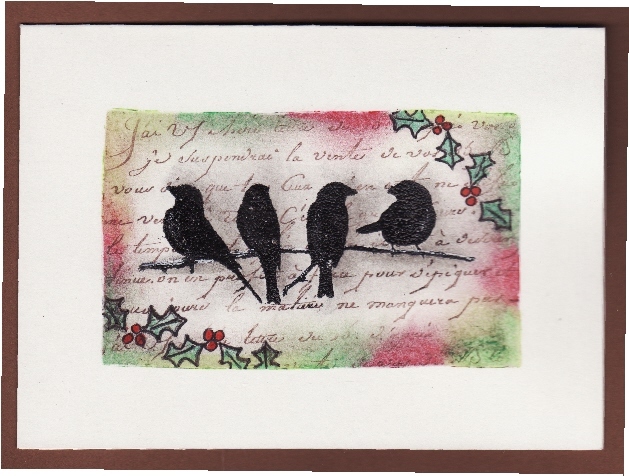 I stamped with a Hero Arts Old French Writing stamp in VersaMagic Jumbo Java ink. I made sure I applied enough pressure on the stamp in order for it to stamp right up to the edges of the opening top piece. 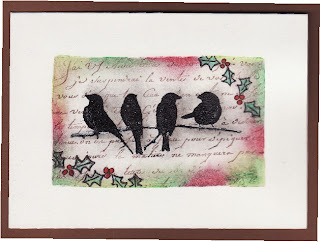 I then stamped my bird stamp, Inkadinkado birds on branches stamp in Black Soot DI and embossed it also with black EP. I then stamped my holly leaves in black ink and wiped off the black ink on the berries on the stamp because I wanted them to be really red. I used 3 colours of pastels for around the edges, leaving my top piece of paper on til the pastel part is complete. I scribbled in different areas around the opening close to the edge with a lime green, leaf green and a red pastel. I used a different finger between colours so they pastels don't get all muddy, I rubbed and smooshed the colours and blended the hard edges to soften them and blended into the next colour beside it. I then wiped most of it carefully away with a tissue so the paper is actually stained with the colours of the pastels. I then removed my window piece. I then took some pencil crayons and coloured in the holly leaves and I used a Sharpie red marker to really make the berries stand out. I also added a bit of grey pastel to the right side of each bird to give them a 3-dimension look. I took a black sharpie fine tip marker to go over the stamped holly leaves and circle the berries and a white gel pen to line the top of the branches for a bit of snow. That is it, my one layer wonder. Hope Sarah and the gang over at Inkurable Stampers like it. This is stunning! I know I would have a hard time with only one layer, but you've given this so much beautiful dimension and interest with no embellies. So impressive - I love it! I'll bet it's even better in real life too! So much depth - great work! Wow! This is gorgeous! Masking is one of my favourite techniques and you've really showcased it here. What a lovely card.